Not a pretty bird, nonetheless he is impressive. The snow storm of last week dumped over ten inches on Dill City and but a smattering in Piedmont... for once the weathermen were correct. The winds have been rather horrific, with Sunday producing fifty-three mile per hour gusts... it was a hang-onto-your-hat kind of day. This week promises mild temperatures, however it is simply teasing us; expect winter to last at least another month. The gathering of crows is impressive this year as they may be seen quietly perching in trees by the hundreds before suddenly mass-flying in a graceful circular dance. These communal social gatherings are called a roost and some may contain thousands during the non-breeding winter months. During the breeding season, Crows tend to congregate exclusively among their extended family, which may include many generations. Crows mate for life and they have a very long life span... the oldest on record lived to almost thirty years. The female incubates the eggs, however her mate will bring her food and guard the nest when she leaves for short excursions. It has been noted that frequently a younger cousin may slip in and sit on the eggs or nestlings, which is a sign of their close family ties. 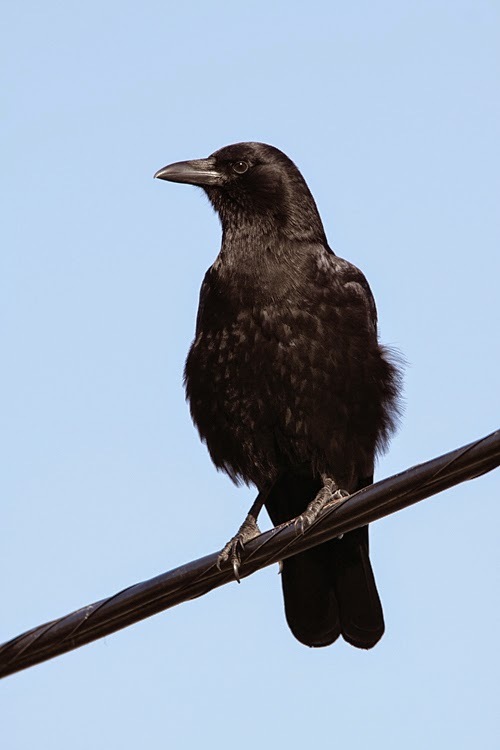 Crows are considered to be among the world's most intelligent animals with an IQ approaching that of apes. They are capable of tool use and construction, often picking up twig to dig grain from a bale. Crows have been noted to engage in feats such as air sports and they have the ability to hide and store food across seasons, placing grain in carefully selected crevices. They have a memory which recognizes individual faces and habits of humans and use experience to predict the behavior of those they encounter. If one has been kind to a Crow, he will remember you just as he will remember if you have not. If one splits the tongue of a young crow, he may speak perfectly, answering questions correctly, and he may even count to five. Naturally there are mythological stories of the Crow and they rank among the most prolific, with tales from all parts of the world transforming them into magical supernatural beings ranging from a hero to trickster. It has been said the Crow or Raven was the principal envoy of the Maker of Life, Odin and Apollo; one served or defied the Wind, the Lords of Death, and Satan. They were said to have brought the sun, stars water, tides and humans into this world. The Crow was believed to guard the fortunes of England and thus they were kept in the Tower of London. He is included in two of Aesop's Fables... the stories of the Crow's interaction with humans are endless and span every past or current religion or belief. Farmers may lament the crow for his habit of stealing grain, however we must remember to thank them for taking over an unpleasant task since our carcass-cleaning Vultures have migrated. During this leafless time, the gathering of Crows are easily visible so enjoy their majestic flights this winter... they are truly an amazement.